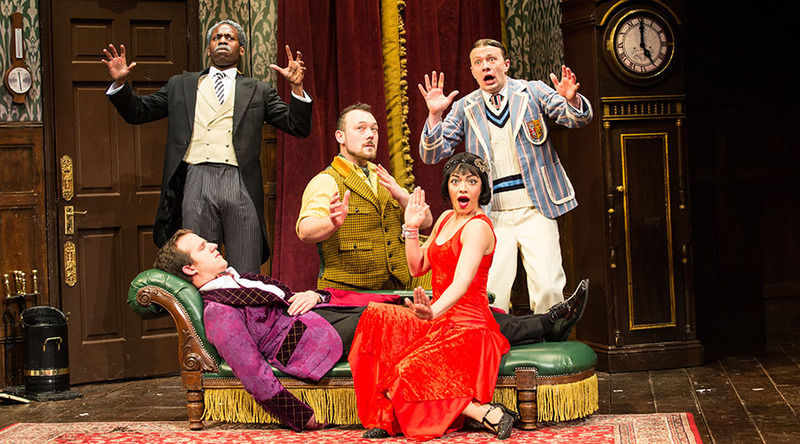 THE PLAY THAT GOES WRONG is rated 4.9 out of 5 by 50. Rated 5 out of 5 by Linzijean from Non stop laughter Bought these as a birthday present for my mum and it was the best birthday present I got her she said. Best night if you want a great laugh out loud play to see. Already looking to see The Bank robbery now. Rated 5 out of 5 by Lara18 from Doesn't disappoint We want as a family with our 17 and 19 year old son and daughter. I had previously seen A comedy about a bank robbery by the same company and had very much enjoyed it. Laughed all the way through , great comic timing and set design. Would recommend to anyone , we enjoyed it as much as the older people next to us and the much younger people behind us. Rated 2 out of 5 by Theatre regular from Not as funny as the reviews would have you believe. I really wanted to enjoy this show and having seen lots of wonderful reviews, was looking forward to splitting my sides laughing. Alas, it is not that funny. Yes, the cast work hard (both physically and verbally) to create humerous situations and a lot has gone into the staging too, however the whole is NOT greater than the sum of its parts...sadly :-( One to avoid. Rated 5 out of 5 by Irene 73 from Excellent play Play was recommended by a friend. Haven't laughed so much in a long time. Very well acted. One not to be missed. Rated 4 out of 5 by Carms from Hilarious from start to finish Having arrived and in our seats the show starts without us knowing what was happening. 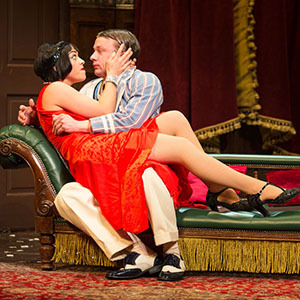 It had everything from slapstick, innuendo, mime and audience participation through out. Couldn't stop laughing the whole time. 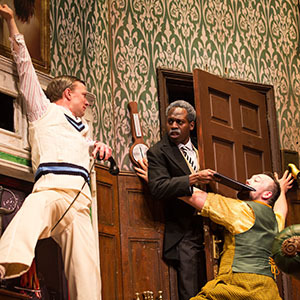 Rated 5 out of 5 by Flatcoat12 from This play was very funny If you like slapstick, this is the play for you. The timing was excellent throughout. Take your seats early as the actors appear from about 7.15 onwards. 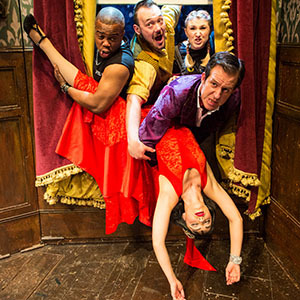 Rated 5 out of 5 by AndyG 8511 from The play that goes wrong Went to the Dutchess Theatre in the Strand to see the play that goes wrong. Warning though. If you have a cardiac or respiratory problem don’t go. It was a laugh from start to finish, in fact I haven’t laughed so much EVER. I hope that the cast get to see the reviews because they work so hard and deserve all the credit they get. To do this 8 times a week must be exhausting. Very well done to all of you!!! Rated 5 out of 5 by tanuki from Even better the second time around! We saw this in March 2018 and laughed so hard we were gasping for breath! We figured we see it again and be amused because we'd know what was coming and it would be fun in a different way! Boy! Were we wrong! They've changed some of the cast since March and made some changes to the script so even though the story followed along the same lines as what we saw in, it was enough of a change to make it fresh and (hard as it may be to believe) even funnier! If you only see one play while you are in London, this should be it! Rated 5 out of 5 by Jacki 3wheels from Complete giggle! The third time I've seen this play and it was just as good as ever -a complete giggle from even before it started right to the end. Go and see it before it finishes in Feb 19! Rated 5 out of 5 by halcon0 from The Best Comedy I have seen this year I went with half of my family (including children), and we laugh from beginning to end. Great performers and very funny. Love it and have been recommending it. Rated 4 out of 5 by Gaynor55 from Funniest play I’ve seen in along while I booked this at the last minute because my husband and daughters went away for a few days. Thought I would treat myself and so glad that I did. It was so funny my throat hurt from all the laughing. Rated 5 out of 5 by jessiewarn from Most fun I’ve ever had at the theatre Family trip to the theatre with kids aged 10 and 12, all left with aching sides after laughing for two hours straight! Comedy genius, impeccable timing, loved every character - and would watch it again tomorrow. Rated 5 out of 5 by Jules958 from The Play That Went Wrong Such an excellent play so funny! Timing was impeccable and slapstick so well done. Haven’t laughed so much in years the cast were amazing!! Rated 5 out of 5 by 22Lizzy from Funny ,funny funny. A must see Thoroughly enjoyed the play. Excellent cast. Very clever. Excellent timing. Rated 4 out of 5 by rebell4 from A masterpiece of mishaps! This was my second time seeing this play, and it was just as funny as I remembered! The current cast brought their own eccentricities to the characters, and the timings for all the mishaps were spot on. A fun night out! Rated 5 out of 5 by Bossman77 from Thoroughly entertaining throughout! Loved the play from start to finish. Great acting and the use of the stage with it breaking down at various points was good. Found it as funny as Book Of Mormon. Would recommend to anyone who found that amusing. Sat near the front and had a good view of the stage and a bit of interaction between the cast and crowd. Rated 5 out of 5 by Kalsha from Hilarious! Glad we went! Was a last minute decision but so glad that we went. Never laughed so much. Very talented actors. So much going on all over the stage. I would definitely see it again! Rated 5 out of 5 by Jopal from Brilliant fun Suitable for any age, great fun but with plenty of silly slapstick farce. Seriously funny! Rated 5 out of 5 by Jodiebd3b from Cried with laughter My husband and I took our 12 year old daughter to this show and we all cried laughing. Insanely funny, perfectly timed slapstick, brilliantly "un-acted" and really good clean fun. You have to go see this show. Rated 5 out of 5 by Clark16 from ‘Such fun’ We saw this play over a year ago and still talk about it with friends! If you have ever been in an amateur dramatic society it is very relatable. Amazing, this show is hilarious from start to finish. We have seen all three productions from this theatre company (peter pan, bank robbery) based on how much we enjoyed this show. The cast and their timing is impeccable! How they keep in character is beyond me! You must see this show! Amy and John Clark. Rated 5 out of 5 by Nana bear from The funniest play i’ve Seen all year From start to finish the play was a riot of fun and very cleverly put together. The actors worked hard throughout the performance and deserved the laughter and applause they received. Rated 5 out of 5 by jackstarliner from Laughed till my chest hurt I went with my friend after getting a notification of discounted ticket availibility. My simmer budget was kaput so this kissed the pain away when we clinched front row seats for a great price. After seating the play started immediately with one of the characters asking us where her dog Winston was and Trevor, the lighting man, basically told the audience the play was going to be rubbish. We knew we were in for a great night. Modern slapstick in the vein of the 80s comedy "The Young Ones". High energy from the set falling to pieces and the actors.....falling to pieces whilst all of us fell to pieces with laughter. This theatre was intimate and cosy, staff were professional and pleasant. Great night. Rated 5 out of 5 by Suzannahhale1994rob from Absolutely amazing The play was fantastic and hilarious will be recommending to everyone!